Update: Added additional image from @evleaks. Here it is -- the LG Nexus 4. Some official-looking press renders for the much anticipated fourth-gen Nexus phone has emerged via noted Twitter leaker @evleaks. The images confirm what we've already seen from the extensive Belarusian leak of a few weeks ago, while showing us the final rear chassis design. As expected, "with Google" is gone, and in its place is a big old Nexus logo. In addition, LG's "crystal reflection process" back has dots arranged in a speckled pattern, in a possible nod to the original Nexus One live wallpaper. 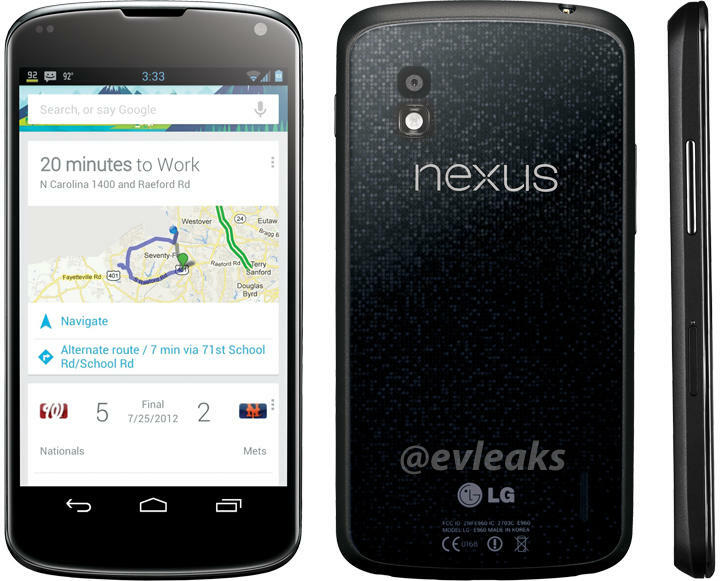 In any case, it seems this is our clearest look at the Nexus 4 yet. Don't forget we'll be live from New York City next Monday, Oct. 29, to bring you full coverage of Google's new Nexus devices and Android announcements! Check past the break for the original image, and discuss in the Google Nexus 4 forums.